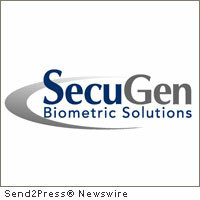 SANTA CLARA, Calif., July 18, 2011 (SEND2PRESS NEWSWIRE) — SecuGen Corporation, a world leading provider of optical fingerprint technology, announced that it has filed a lawsuit in the U.S. District Court of the Northern District of California against Korean biometric company Suprema Inc. for patent infringement. The complaint is related to U.S. Patent No. 6,324,020 issued in 2001 and owned by SecuGen, which covers invaluable technology for acquiring high quality fingerprint images that are crucial to the performance and accuracy of optical fingerprint sensors in biometric security applications. Suprema’s products accused of infringing SecuGen’s patent cover a vast range of optical fingerprint biometric Access Control, Time Attendance, Embedded Module, and PC Solution products, which include but are not limited to: BioEntry Plus, BioLite Net, BioLite Solo, BioMini, BioMini Plus, BioStation, BioStation T2, D-Station, SFM 2020-OP, SFM3020-OP, SFM3030-OD, SFM3040-OC, SFM3520-OP, SFM3530-OD, SFM4020-OP, SFU300, and SFU500. Since 1998, SecuGen has made considerable investments to conduct true research and development on its core technologies and to develop, maintain, and protect its valuable patents throughout the world in North America, Europe, and Asia. In addition to seeking a declaration by the Court that Suprema’s importation, use, sale or offer to sell fingerprint biometric products in the United States infringe SecuGen’s patent, SecuGen is seeking preliminary and permanent injunctions against Suprema’s future infringement of the patent and recovery of treble damages for knowing and willful infringement by Suprema. SecuGen Corporation, 2065 Martin Avenue Suite 108, Santa Clara, Calif. 95050, USA; Tel 408.727.7787. – RSS news feed for SecuGen Corporation: https://send2pressnewswire.com/author/secugen-corporation/feed . Original Keywords: CEO Won Lee, SecuGen Corporation, optical fingerprint recognition technology, biometric Access Control, Time Attendance, Embedded Module, and PC Solution products, patent lawsuit, Korean biometric company Suprema Inc SecuGen Corporation Santa Clara California SANTA CLARA, Calif.
REFERENCES: Biometrics and Bioware News, CEO Won Lee, SecuGen Corporation, optical fingerprint recognition technology, biometric Access Control, Time Attendance, Embedded Module, and PC Solution products, patent lawsuit, Korean biometric company Suprema Inc SecuGen Corporation Santa Clara California SANTA CLARA, Calif.